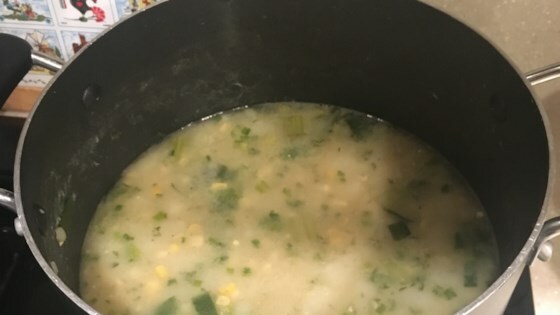 "A delicious corn chowder discovered by accident. I ran out of milk and only had nondairy creamer, which is lactose free." In a 3 quart pot over high heat, combine the potatoes with enough water to cover. Boil for one hour, adding water to cover potatoes as necessary. Add the celery, leeks and scallions and boil for another hour. Reduce heat to low, add the corn and parsley and heat through. Add the non-dairy creamer just before serving. Enjoy! Awesome! Tastes great and lactose free - just what I need. Great recipe. Healthy and wonderful...thanks for helping my family stay healthy!! Sir, thank you for finding this. I get terribly sick from dairy. I can't wait to try this! Happy New Year! Not too many healthy recipies floating around here so thanks. I loved this. It is very healthy, for the vegans out there, this is a great recipe. Thank you! !